With numerous sea routes radiating from its central port, Thessaloniki, the second largest city in Greece, lies protected from the wrath of Poseidon, thanks to its position deep within the Gulf of Thermaikos. Blessed with mountains to its north and the moderating influence of the sea, the second largest city in Greece is also the food and fashion capital. Its streets are always thronged with stylishly dressed people walking among ancient ruins and the inspiring waterfront lined with relaxing outdoor cafes and no-frills restaurants serving some of the best food in Greece. A street named Mitropolis runs through the town centre, showcasing many well-known and little known brands and fashions. The clothes worn here reflect the taste and stylishness of the residents. Winter brings out their best. On the confusing streets which branch off at acute angles, museums and historical relics are embedded within the urban sprawl. Most of the city is spread out over a hillside. If the traveller is lost in a sea of unfamiliar buildings, he just needs to walk downhill and he’ll eventually reach the seafront. The guide books mentioned that the metro would be ready in 2015, but not surprisingly, the project has been abandoned. We left cold and rustic Litochoro on a bus bound for nearby Katerini. Anticipating a change of bus at the terminal, we were about to unload our luggage when the driver who spoke very little English said: “Thessaloniki stay.” We got back on the same bus and after a brief interval, the same bus departed for Thessaloniki. The journey took only an hour or so. The bus pulled into the bus terminal with a rather unique dome that projected its Macedonian identity. It was a huge place; the largest bus terminal we had encountered so far in Greece. A taxi from the bus terminal brought us to the hotel I had earlier booked on booking.com. It was a relatively upmarket place (for €140 a night) that made us look a bit out of place with our backpacks. I always make it a point to try a variety of hotels and restaurants on my travels. 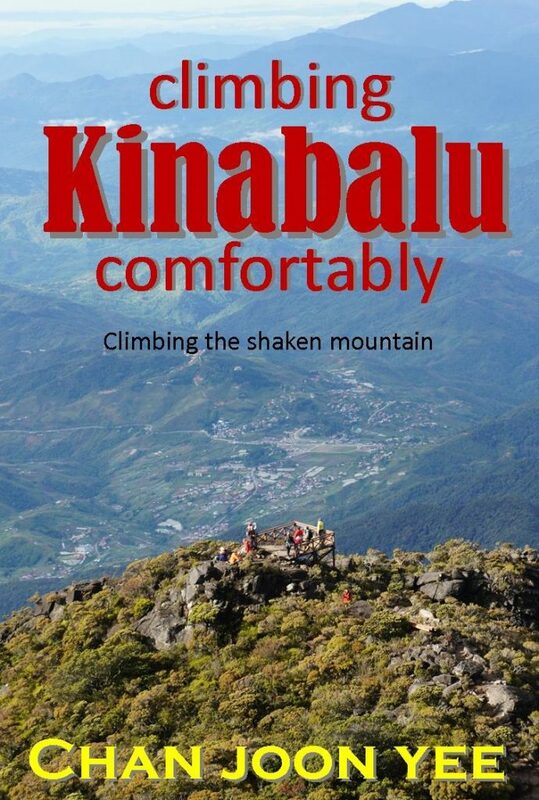 At more than three times the price of our accommodation at Kalambaka and Litochoro, the difference was obvious. The fittings were new, the pillows were thick and the sheets smelled of flowers in spring. We squeezed into the tiny elevator and in spite of Astoria being an upmarket hotel, the elevator was still the tiny, semi-auto type. We went out for a walk and decided to make up for missed lunch with some tasty snack at a cafe. Top on our list of must-sees, was the White Tower which has a gruesome history – one which the Greeks are unlikely to forget. The former tower was a Byzantine fortification meant to deter the Turks. It didn’t work. The Turks led by Sultan Murad II captured the city in 1430 and refurbished the structure into a prison for Greeks who had plans to regain control of their homeland. Mass executions of both rebellious Greeks and disobedient Christian Turks took place here. The walls became soaked through and permanently stained with blood. The Turks called it the Kanli Kule or Blood Tower. Unlike the southern part of Greece, Thessaloniki did not return to Greek rule until 1912. Once the Greeks regained control of the city, they promptly whitewashed the blood-stained tower and henceforth called it the White Tower. With its gruesome history, I wonder if there can be any building more convincingly haunted than this. In spite of the books telling us that garlic is used to ward off evil spirits here, Greece is no Thailand or Bali, so you won’t step on any flowers, fruits or burning incense when you walk around the former prison, torture chambers and execution ground. The interior of the White Tower looked like the inside of a cave. There are wide steps that spiral gently upwards in an anti-clockwise direction. After an encircling climb in the dimly lit path, a door opens to a balcony. Once you’re recovered from the glare, there is an awesome view of Thessaloniki beneath. The White Tower has 6 floors in total. 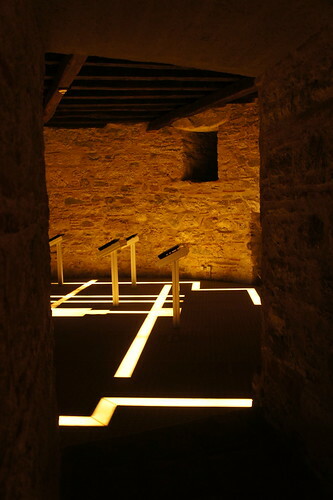 Each floor houses exhibits on a different theme. They would have all been very informative and meaningful if only I could read Greek. 400 years of Turk occupation is not the only tragedy that Thessaloniki suffered. In 1917, a great fire destroyed two thirds of the city leaving more than 70,000 homeless. Burning uncontrolled for 32 hours, the fire razed 9,500 houses within a radius of 1km. The destruction was so devastating that half the Jewish population abandoned the city. Instead of rebuilding the city promptly, the government commissioned the French architect Ernest Hébrard to design a new urban plan to rebuild the destroyed part of the city from scratch and also to make plans for the future expansion of the city. The designs of Hébrard are still evident in the city, most notably Aristotelous Square. However, some of his most grandiose plans were never completed due to a lack of funds. 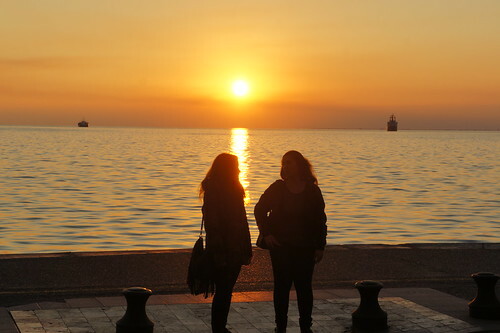 All that and the current financial crisis fail to cripple Thessaloniki. It was the start of the weekend. 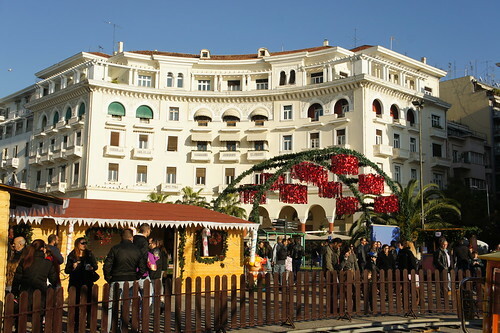 There was a fair being held at Aristotelous Square. A ship built with a retro design docked at the pier takes you on a cruise to nowhere around the bay. No tickets to buy. You just need to pay for a drink onboard. In Singapore, this would certainly sound a scam alert. But this is Greece and the usual bait and fleece trick is not so common. Still, I’m not sure what they do to cheapskates who refuse even to buy a drink on the cruise. The city of Thessaloniki was founded in 315 BC by king Cassander of Macedonia. 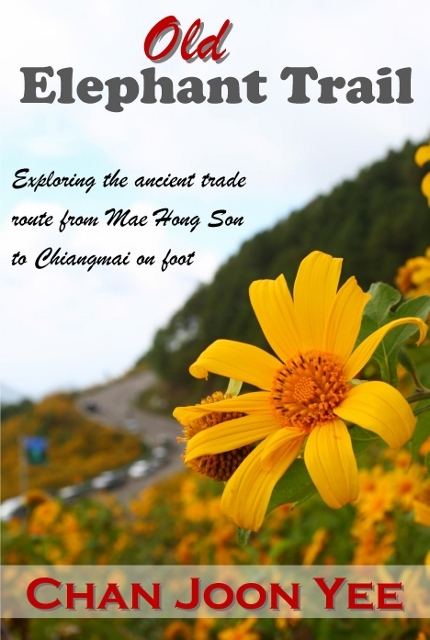 Some sources claim that it was named after the half sister of Alexander the Great. Others gave a more plausible explanation. The Macedonians received help from their allies in Thessaly when they captured the city. 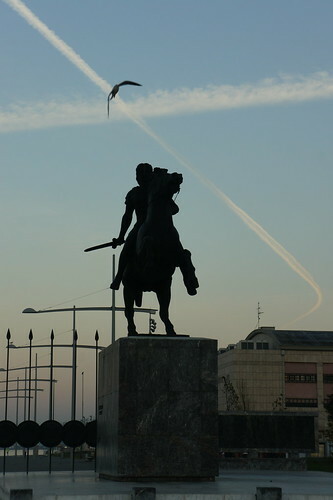 It was hence named Thessaloniki meaning victory of the the people of Thessaly. Then, the Romans came and turned the city into an important port. During the Byzantine period, it was the second largest city after Constantinople in the Eastern Roman Empire. 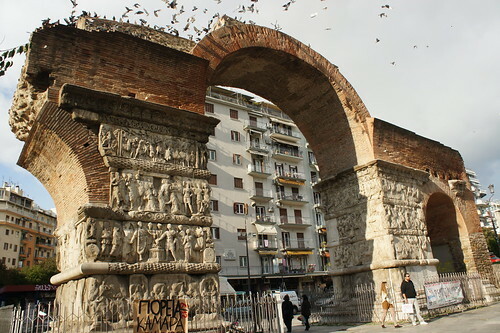 One of the most prominent Roman structures here is the Arch of Galerius. There are reliefs carved on the stone arch, celebrating Roman Emperor Galerius’ victory over the Persians in the 4th century AD. Next to the arch, is an interesting building called the Rotunda. It was originally planned to be a Mausoleum to house the Emperor’s remains after he passed on. But it has been rumoured that Galerius the anti-Christ emperor, suffered from painful sores (probably shingles) in his old age and believing that it was a punishment from God, he repented just before he died. I don’t find the second half of this story believable, but earlier on, Galerius did indeed put his own daughter to death for embracing the Christian faith. Regardless of Galerius’ faith or change of faith at his time of death, the Rotunda of Galerius was converted into a Christian church in the late 4th century. It was then named Agios Georgios or Saint George Church. I’m not sure what it looked like then, but I’m sure you can tell that the Rotunda looks like something else. 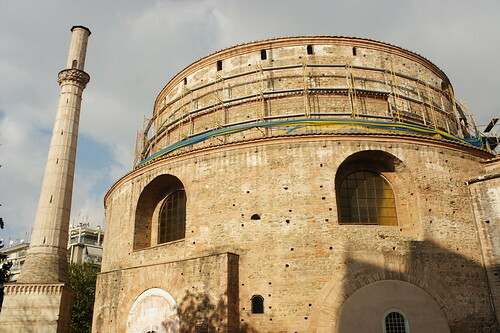 Yes, the Turks conquered Thessaloniki and after leaving it alone for 100 years or so, decided to turn it into a mosque. Fortunately, the Byzantine mosaics were just painted over and not hacked off. When the Greeks regained their independence, they simply removed the paint and restored the underlying murals. Tell-tale signs of the former mosque are still evident. Unfortunately, we didn’t get to see the inside on our visit to the Rotunda. The place was closed for maintenance and reconstruction. 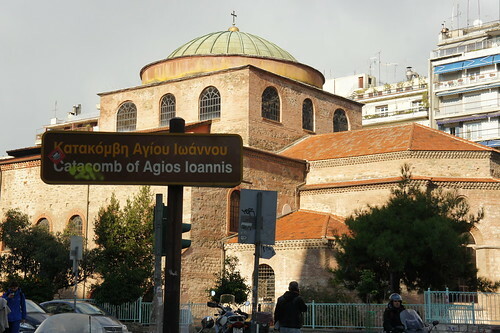 The most important church in Thessaloniki is the one named after its guardian saint, Agios Dimitrios or Saint Demetrius in Latin. 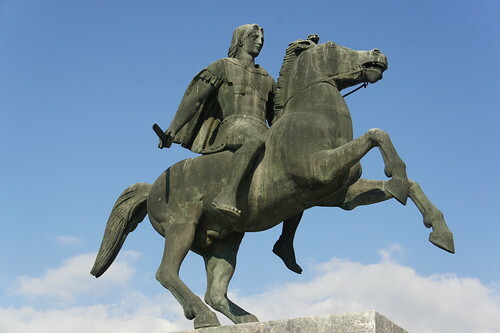 According to legend, Dimitrios was born in Thessaloniki in 280 AD. He came from a wealthy and influential family. In his prime, he was an officer in the Roman army. Then, as fate would have it, he embraced Christianity and secretly preached to his community at a time when pagan Emperor Maximinus banned the preaching and practice of Christianity. The Emperor was disappointed and ordered Dimitrios to be locked up in a Roman bathhouse until he came to his senses. Not only was Dimitrios undeterred, he met a gladiator by the name of Nestoras at the bathhouse and managed to convert him to the Christian faith. Then, in a fight between Nestorias and the Emperor’s champion gladiator Leo, Nestorias, who was clearly the underdog, defeated his opponent. This shocked everyone at the arena. To add salt to the wound, Nestorias announced that he had won because of his Christian faith. Emperor Maximinus was embarrassed and insulted. Furious, he ordered both Nestorias and Dimitrios to be executed, making them Christian martyrs. The tides soon turned against the pagans and when Christianity took root in the Byzantine era, Dimitrios was posthumously granted sainthood. 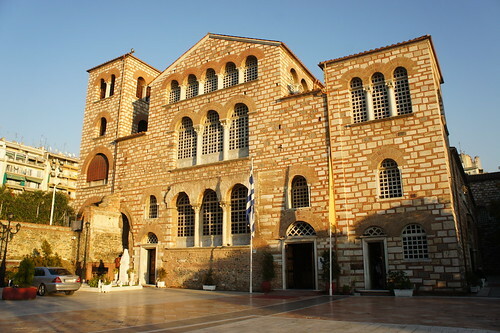 A church was built in Dimitrios’ honour and till this day, he is regarded as the guardian saint of Thessaloniki. Agios Dimitrios is located in a quiet neighbourhood with a couple of beggars loitering around the compound. As we entered, the silence in the church commanded our utmost respect. The mood was sombre and discreet. The ceiling was supported by huge columns and intricate Roman arches. It’s probably one of the biggest churches I’ve seen. You could witness the faith of the devotees as they kissed the glass framed image of Virgin Mary near the entrance. Their prayers were cursory, but you know that one way or another, Dimitrios has been immortalised. 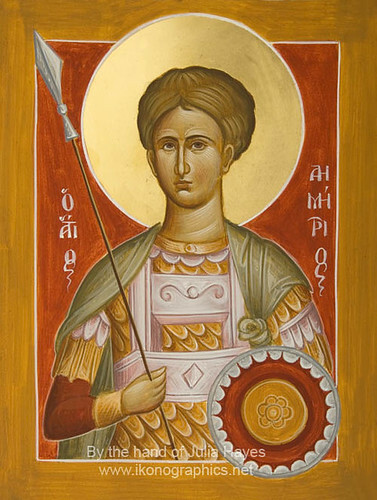 With his military background, Saint Dimitrios is often depicted as a warrior. But even in his military uniform, images of Saint Dimitrios are far from intimidating. There is another warrior who is far more visible and obvious to outsiders. 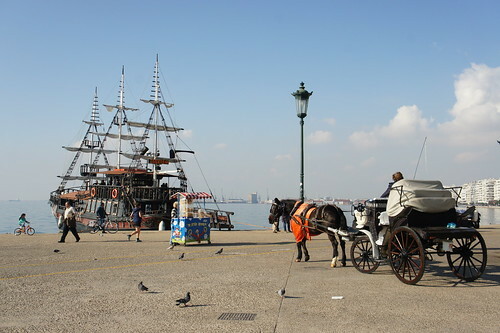 A bronze statue of Alexander the Great on his horse stands alongside the waterfront and it seems to be guarding the bay at Thessaloniki. While no flowers were placed at Alexander’s bronze statue and nobody prayed at his feet, the visitor should have no doubt that this was a great man that Greeks revere. More about Alexander the Great in the chapter on Pella. Apart from these relics, you’ll also find a Roman agora (city square) and the Catacomb of Agios Ioannis or Catacomb of Saint John’s Church in English. Again, the place was closed when we were there. Archaeological evidence suggests that the place was originally a temple for pagan worship. Its abandonment was not explained. Early Christians took over and dug tunnels under it to practise their faith in secrecy. Rumour has it that the network of tunnels may lead one to Agios Dimitrios and the Roman agora. With all the hectic traffic, the noise and the crowds, I was beginning to miss the pure mountain air at Meteora and Mt Olympus. 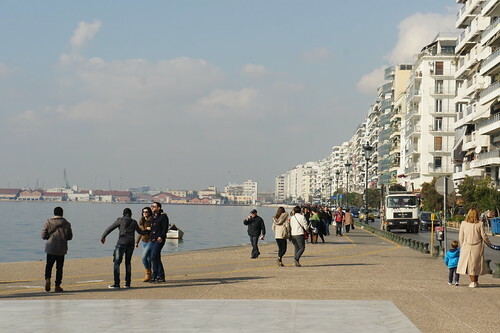 Then, Thessaloniki’s ultimate charm unfurled. A golden sunset. It arrests your sense of sight and in that spellbinding moment, mesmerises you and leaves you oblivious to the noise, the crowds and the traffic. 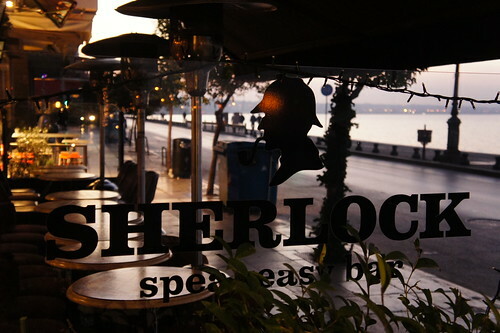 We walked the length of the waterfront once more, taking in the sight till our hunger pangs sent us in search for dinner. 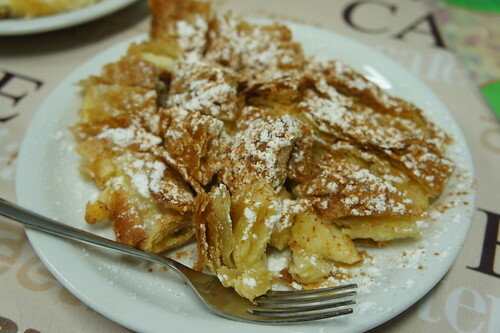 To be honest, you won’t find the Singaporean variety of food in Greece. 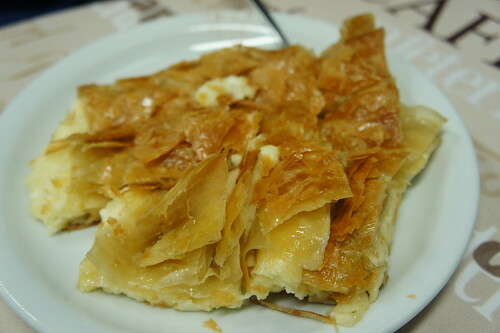 Some restaurants may have more than 20 items on the menu, but it’s still limited the usual Greek food like salads, roast or grilled meat, mezes and so on. Going against conventional wisdom, we settled for the least crowded restaurant and it exceeded our expectations. The little guy had to have his feta cheese fix. 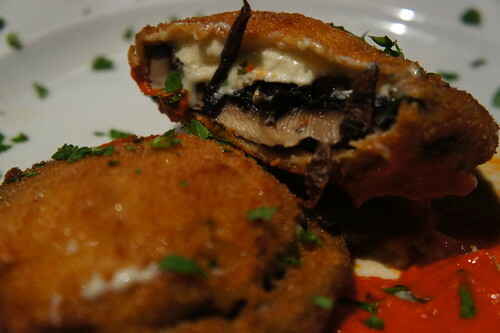 The most interesting dish I had that evening was something called stuffed mushroom. It’s something like our oyster cake, except that it’s got mushroom and cheese inside. 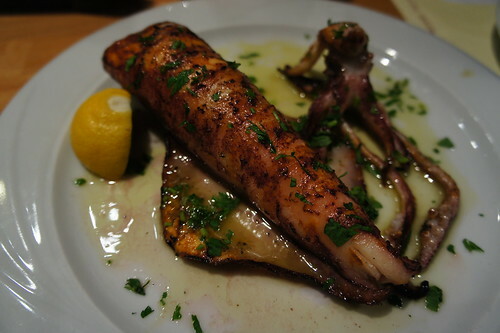 Of course, the grilled squid was pretty awesome too. We bought some drinks and snacks at the convenience store near our hotel and on our way back, I wondered if there was any money in the ATM at Alpha Bank, thanks to news reports of bank runs and empty ATMs. I asked the receptionist. It was a middle-aged lady on duty this time. “Of course there’s money in the ATM. Go ahead and use it.” she said, giving me a strange look. It’s such an irony. We read the news to gain knowledge, but knowledge becomes misinformation when we fail to distinguish the transient from the permanent, the isolated from the widespread. Breakfast at the Astoria was not provided. This is not necessarily a bad thing. A breakfast buffet here was priced at €5 per person. Definitely not expensive by Singapore standards, but there could be more interesting choices outside. It was still dark at 6.00am. We crossed the road and found a shop that sold baked pies. 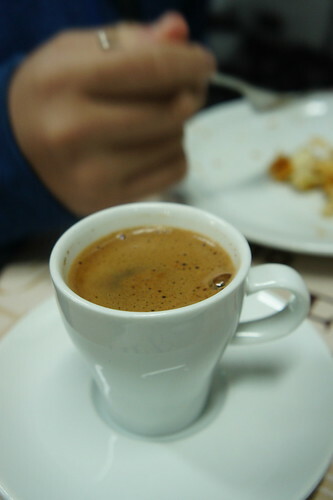 It was a very satisfying breakfast which provided lots of calories to fight the cold. We were off to Pella and when we returned in the afternoon, there was a demonstration going on. A police bus was parked right in front of the hotel. The bearded receptionist assured us that everything was fine. The museums were already closing, so we decided to just take a walk around. 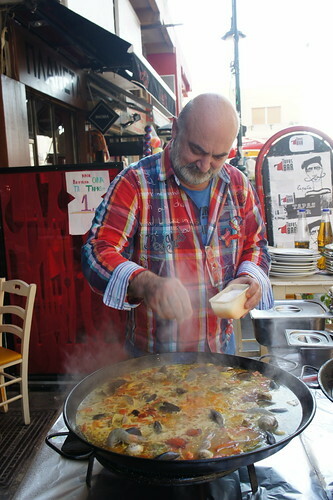 As we passed a restaurant which was full on the previous night, I saw the chef preparing the Greek version of paella outside. As we had not had lunch, I urged the little guy to try it. He was reluctant at first, but quickly changed his mind. He liked it so much that my credibility and respectability in the eyes of this cynical teenager must have moved up a few more notches. It was here where I had my first taste of ouzo, a clear, colourless 40 degree proof liquor with the flavour of star anise. It can be drunk in straight shots, but once you add ice to it, it turns cloudy. 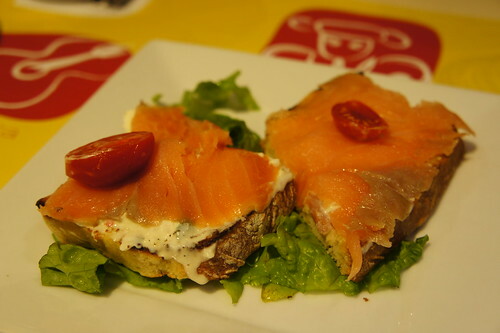 Besides the Greek paella, we also had some salmon on toast. It seemed that going beyond feta cheese was not a problem for him at all. Then, we decided to do some random walking after our late lunch. We wandered off inland and came to a church. 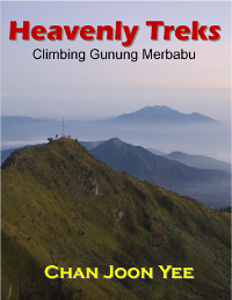 Then, I noticed that two women had been virtually running after me on the steep incline. 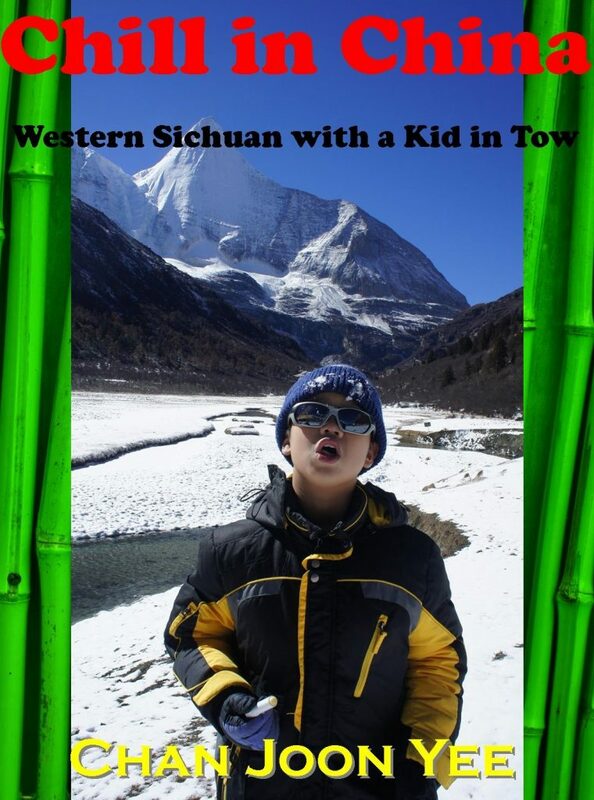 One of them finally approached me and introduced herself – in Mandarin! Naturally, I was more than a little surprised. “We notice that in recent years, many Chinese people have come to live in Greece. That’s why we’ve worked so hard on mastering the Chinese language. We want to share the word of God with you.” she explained. I didn’t have to pinch myself to see if I was dreaming, but this was clearly not what I was expecting to see in Greece. 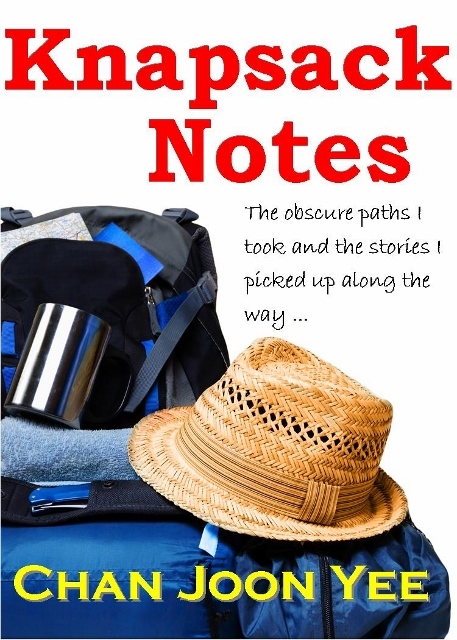 Weird encounters like this make travel so intriguing – provided they don’t knock you off-course. I told her that we didn’t come from China and nor were we living in Greece. The second part may change, but I’d be quite unlikely to change my religion. After a short discussion on religion, the women left us alone. We had a tough time finding our way back, but as I said before, we made our way downhill and ended up at the port. There was a restaurant inside, but it was so packed that there was no place to sit. Yes, the Greeks are not giving the recession a chance. Nobody can stop them from enjoying themselves. 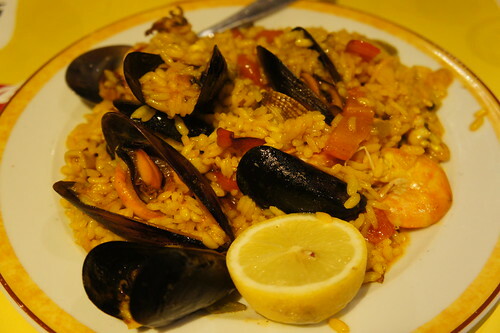 With the flavours of the paella still hooked on our taste buds, we decided to go back to the restaurant where we had lunch for dinner. 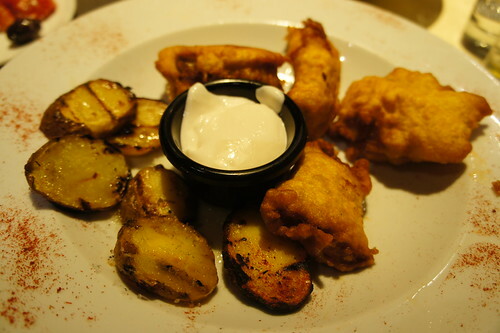 This time, we had Greek salad, bacalao (Portuguese fried fish) and pasta. Simple dishes, but we had advice, suggestions and questions not just about the food, but the drinks to go along. 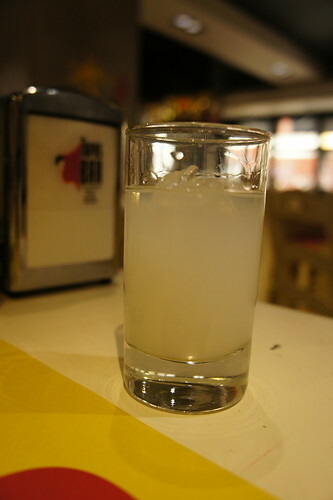 The waiter, in spite of his faltering English, even tried to describe the taste of the drinks to me. As manpower shortages in the service industries plague the vibrant economies, Europe may be the last bastion for intelligent waitering. We were greeted by a cold morning the next day. We had breakfast at the pie shop again. We tried out the meat pie this time and it was just as delicious. 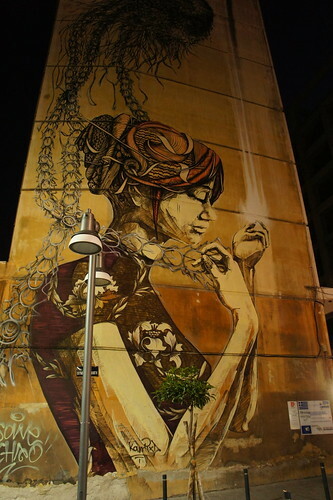 I admired a huge graffiti on the facade of a building nearby. They were everywhere. Most were painted during protests. All were done with great passion ranging from anger to love. In spite of the emotions, churches were always spared. I was determined to see the museums before they closed. We walked along the waterfront as the sun rose from behind the hills. The sea-facing pubs and cafes were all closed, recovering from a busy night. There were only people on the jogging lanes and the bus stops. 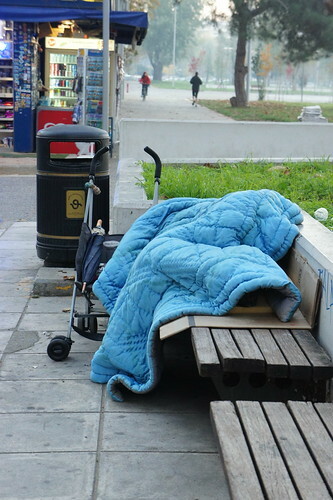 The homeless and unemployed, seeing no reason to rise early, were still buried under thick blankets on the park benches. The rising sun provided little warmth on this winter morning. Dozens of joggers in sweaters passed us by, early anglers tried their luck at the edge of the wharf as great Alexander kept his mighty pose on the marble pedestal. There is no doubt who the most admired man in Macedonia really is. Till this day, plays about the great conqueror are still being staged at the theatres here. 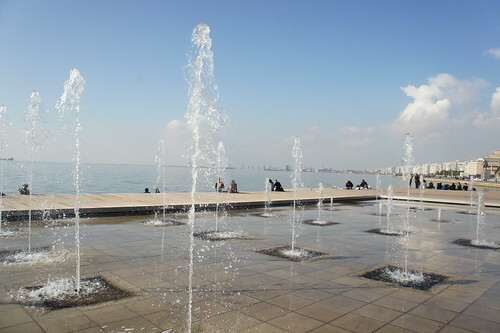 Thessaloniki is a thriving arts and cultural centre. There is even an annual film festival held here. The tickets for theatre performances can cost as much as €100 but those who can afford are reminded that they are also paying for those who can’t. Students, disabled people and the unemployed get to watch for free. 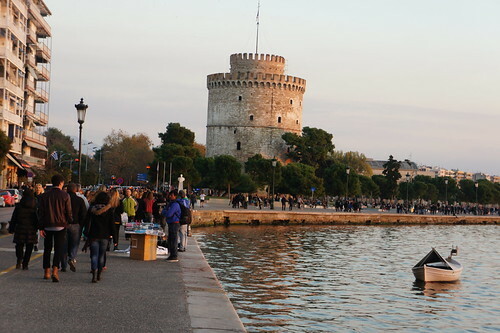 I wonder how prolific a writer I could be if I could stay in Thessaloniki for a year, jogging along the waterfront every morning, taking time to savour breakfast and coffee, writing for the rest of the day, then watching a play in the evening. I could take a hike in the hills in autumn, take pictures of spring flowers in the mountains or take a dip in the sea in summer. Government-trained experts and struggling Singaporeans would be so certain that I’d end up on the park benches. I’m not so certain. In spite of their economic “intelligence”, I doubt Singaporeans are very good at predicting happiness in this very different part of the world. It took quite a lot of asking before we finally located the museums we wanted to see. I’ll write a bit about the museums in another chapter. Two of the most notable ones are the Museum of Byzantine Culture and the Archaeological Museum. A young man working at the Aristotle University informed us that the Byzantine museum here is the biggest in Greece. He walked us there just in case we got lost. He also advised us to see the university if we had the time. Unfortunately, we didn’t. It would be interesting to witness the legacy of the world’s greatest thinkers. What struck me about this young man, was the genuine sense of pride and enthusiasm in his recommendations. He remained proud and enthusiastic even though he had to save up the finishing hand-rolled cigarette tips so he could roll them together for another smoke. We rushed back to our hotel to check out before noon. As we waited for a taxi to the bus terminal, I dreamt of a long stay in this charming city.